The final day of most music festivals tends to be a bit of a bittersweet affair. There is the inevitable comedown from charging into the weekend and going hard over two days catching performance after performance, as well as the creeping knowledge that all of the fun is coming to a close with the real world waiting just over the horizon. On the flipside, there is still another full day of music and fun waiting for festivalgoers. Helping attendees focus on the positive, Sunday at Shaky Knees dawned with some of the best weather of the weekend. Fans who found their way back to Central Park were greeted with cloudless skies and a cool breezy afternoon. We stared off the day at the Ponce De Leon stage for an early afternoon dose of new-wavey indie pop served over a foundation of goth courtesy of singer-songwriter Frankie Rose. Rose and her bandmates did an admirable job despite being a bit put off by the bright afternoon sunshine. Toward the beginning of her set, Frankie addressed the crowd confiding that she felt a bit exposed in the bright light as she was used to playing in darkness. Luckily, her songs still had the emotional weight to hit home regardless. Having shaken off the lingering late weekend and early afternoon fatigue and lethargy at Frankie Rose, it was off to the main stage for Lukas Nelson & Promise of the Real, to soak in the sun and catch some classic country-soaked rock mixed with plenty of blues and soul. Lukas, the son of Willie Nelson, fronting Promise of the Real, Neil Young’s backing band since 2015, didn’t disappoint. While the historical influences were there, think Willie Nelson crossed with Neil Young, Lukas and the band transcended them, creating a sound that was both familiar yet fresh while delivering one hell of a set. Regardless of his genetic background, Lukas Nelson has some serious talent and skill that’s worthy of attention. He is an artist worth seeking out. • All Time Low brought the party. The pop-punk quartet have not lost a step over the past 15 years. Led by magenta-haired lead singer Alex Gaskarth, All Time Low delivered a wildly energetic set that was as much fun to watch as it was to listen. • Black Rebel Motorcycle Club were a force to be reckoned as they supplied the noisy garage rock to a large and eager crowd gathered under the canopy of the Ponce stage. Like Frankie Rose earlier in the afternoon, BRMC bassist/singer Robert Levon Been, guitarist/singer Peter Hayes, and drummer Leah Shapiro are used to performing wrapped in darkness and shadow. While their afternoon set brought the band out into the light, they didn’t lose any of their swagger. Playing songs from their latest release Wrong Creatures, as well as fan favorites like “Ain’t No Easy Way” and “Beat the Devils Tattoo,” BRMC put in one of the best performances of the afternoon. As the weekend moved closer its ultimate finale, a mammoth crowd had gathered at the Piedmont stage to take in Tenacious D. The acoustic guitar rocking duo of Jack Black and Kyle Gass didn’t disappoint. Their delightful performance was part comedy and part sexually charged, hard partying, pop-metal… and all Tenacious D! Not content to just rock the crowd, Black and Gass also broke the news that they’ll be releasing a sequel to their 2006 movie The Pick of Destiny later this year. Closing out Sunday night, and this year’s edition of Shaky Knees fell to indie-rock veterans, The National. 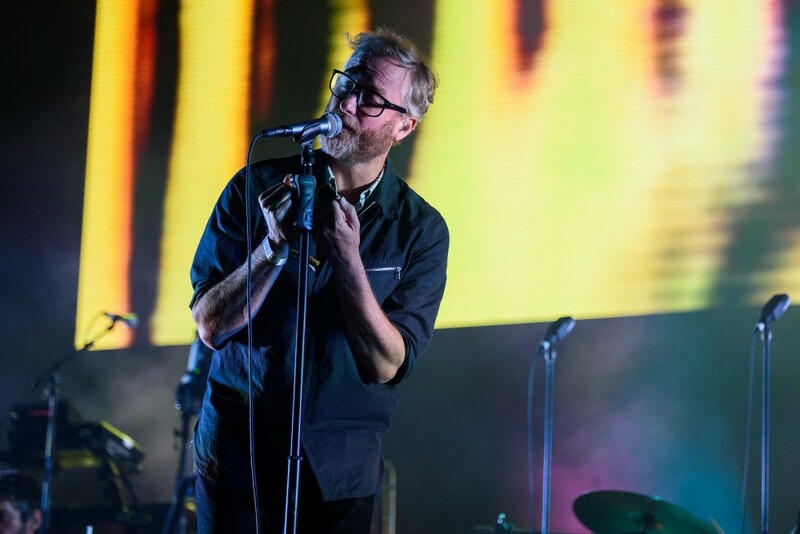 With the stage bathed in muted blue and purple light, frontman Matt Berninger, guitarist Bryce Dessner, guitarist and keyboard player Aaron Dessner, bassist Scott Devendorf, and drummer Bryan Devendorf kicked off their set with “Nobody Else Will Be There,” from their Grammy-winning album Sleep Well Beast. What followed as a powerful and ethereal journey through songs pulled from across the band’s catalog. The haunting and emotional performance was the perfect end to a fantastic weekend of music. Each year the Shaky Knees Music Festival manages to find a way to improve and evolve while staying true to creator Tim Sweetwood’s original vision. This year was no exception. The lineup was focused and well-curated, the site was well laid out and easily traversed, and the amenities were plentiful. The fact that the only negatives were the perpetual dust and dirt cloud that swirled around the Piedmont Stage, and the often long lines at the food trucks, speaks volumes to the efforts that take place during the planning and behind the scenes… Shaky Knees is quickly becoming one of the top US music festivals for good reason!